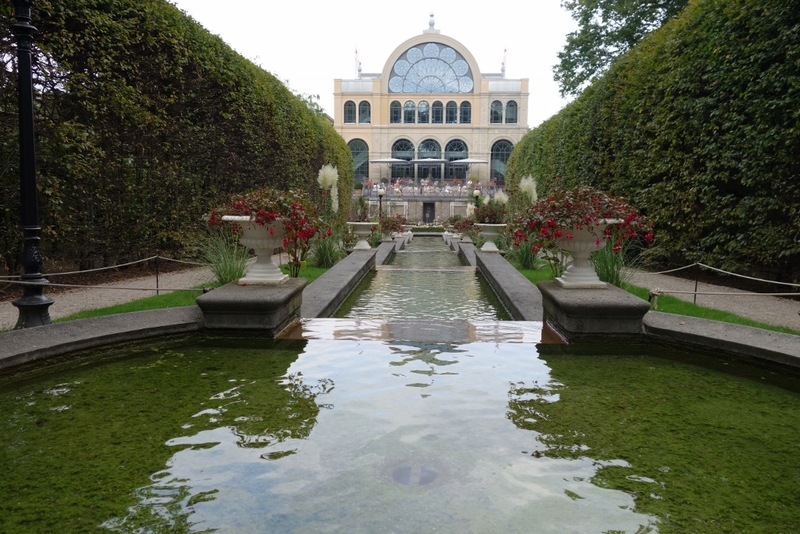 The Flora-Park was designed by Peter Joseph Lenné in 1864 in a “mixed German garden style”. It contains elements of style from the French Baroque, the Italian Renaissance and English landscape gardens. The centre of the park today remains the glass palace (orangery), an architectural structure of cast iron and glass which was particularly noteworthy at the time. The building’s design is clearly modelled on London’s “Crystal Palace” and the Jardin d’hiver in Paris. Flowerbeds framed by an avenue of horse-chestnuts with red flowers form a French parterre on one of the short sides of the building. This is adjoined by an Italian-style area. High arbour walks of hornbeam flank a long, gradually-descending water cascade fashioned out of stone. The year 1906 saw the creation of the small Frauen-Rosenhof, an art nouveau garden. In 1912, the Botanical Garden was laid out directly beside the Flora. It features water-lily pools and a pond into which a waterfall flows from a rock garden. New glasshouses and exhibition houses for exotic and tropical species of plants were added in the 1950s. The Flora park was created on the initiative of citizens from Cologne, particularly as a result of that of the well-known banker Eduard Oppenheimer. A palace-like conservatory was erected at the centre of the park, which was founded on 5th September 1862. Influential citizens met in the banker’s private apartment to pass a resolution on the statute of an “Actien-Gesellschaft zur Anlage eines Botanischen Zier- und Lustgarten” (Company for the Creation of a Botanical Ornamental and Pleasure Garden). The official foundation of the Flora AG then took place on 6th May 1863, the statutes being authorised by King William I of Prussia. A glass palace and an ornamental garden for strolling were created to form an attractive setting for special social occasions of the bourgeoisie, who could thus emulate the lifestyle of the nobility of the period. The centre of the park today remains the glass palace, an architectural structure made of cast iron and glass which was particularly noteworthy at the time. The building’s design is clearly modelled on London’s “Crystal Palace” and the Jardin d’hiver in Paris. The Flora-Park was designed by Peter Joseph Lenné in a “mixed German garden style”. It contains elements from the French Baroque, the Italian Renaissance and English landscape gardens. It was opened within a short time, in 1864. An outstanding work of Rhenish garden design had been created. Flowerbeds, originally surrounded by white gravel paths, form the Dutch parterre in front of one of the short sides of the glass palace. This is adjoined by an Italian-style area. High arbour walks of hornbeam flank a long, gradually-descending water cascade fashioned out of stone. A statue of “Flora”, the goddess of flowers, adorned an antique-style round temple of the same name above the cascade until 1945. The statue was carved from Italian marble by Anton Werres. It was the epitome of southern gaiety in this part of the garden and was, according to Lenné, intended to be a lively visual illustration of the Italian Renaissance. Orange trees and profuse borders of flowers once lined the refreshing water feature. This formal part of the garden is surrounded by sections of the park which were modelled on English landscape parks. Various types of gardens are gathered successfully here to create a small-scale park landscape. Some of these areas are geometrical while others have freely-designed contours modelled on natural features. Modern aspects of garden design were included in the park when it was recreated after the war. Large new greenhouses and showhouses for exotic and tropical species of plants were constructed. From a botanical point of view, the Flora Park is distinguished above all by its rich stock of shrubs and trees. The solitary trees – some of which go back to the time of the garden’s foundation – have grown into impressive specimens over the last 125 years. More than 60 individual trees have been designated natural monuments and placed under special protection due to their size, age and beauty. The Botanical Garden, which covers an area of 4.5 hectares, was opened directly beside the Flora Park in 1912. Water-lily ponds were created as a well as a pond into which a waterfall flows from the rock garden. Together, the Flora Park and Botanical Garden cover an area totalling 11.5 hectares. Today, the Flora is a diverse and harmonious park, the creation of its designer Peter Joseph Lenné. Yet its original appearance has changed over the years – many valuable old trees and all the original greenhouses in the park have been lost. Visitors standing at the entrance look towards the former orangery, which is now an exclusive restaurant. A large patterned flowerbed in the reconstructed French parterre welcomes visitors and provides an impressive setting directly at the park entrance. It is flanked by statues and framed by an avenue of horse chestnuts with red flowers (Aesculus x carnea). This parterre and the park itself have now been renovated, taking into account both historical research and aspects related to park care today. In spring, the meadows under the old trees are covered with bluebells (Scilla sibirica). The Flora Park is set in Cologne’s inner green belt along with other areas such as Fort X and Friedhof Melaten (Melaten Cemetery) (1810). This green belt was created in 1924 as part of Fritz Schumacher’s layout. 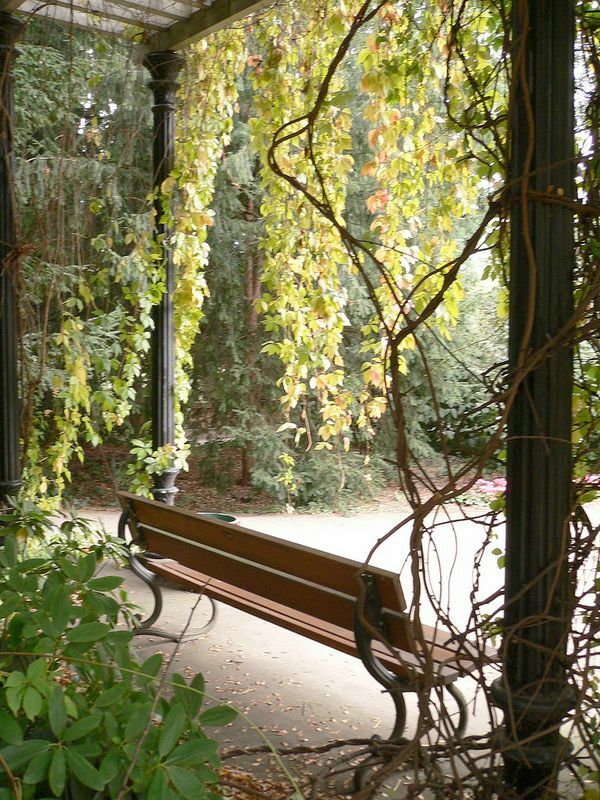 In 1925, Fritz Schumacher and Fritz Encke, the director of gardens, drew up plans which were used to create a green link between the inner green belt and the municipal woods, including a canal, bridges, shrub and rose gardens and playgrounds. After the Second World War, rubble was deposited on large parts of the inner green belt, changing its appearance. from October – March 10 a.m. until 4 p.m.
from April – September 10 a.m. until 6 p.m.